Melt the chocolate bar in the top of a double boiler with butter. Beat egg yolks with sugar until light yellow. Add salt and vanilla. Fold this into the chocolate mixture. Beat egg whites until stiff. Fold beaten egg whites into chocolate mixture. 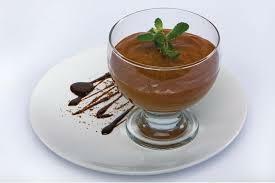 Place in individual dessert goblets and cool in the refrigerator.